Beware: this review will necessarily include spoilers for Uglies and Pretties, the other books in this trilogy. With the New Smoke’s influence and reach growing, Special Circumstances are more active than ever. And the Cutters, a new group of particularly icy Specials under Shay’s leadership, intend to put a halt to their power before things go to far. Tally loves being Special, but will her new heightened senses and abilities prove enough to stop the Smokies from changing the world for good? I was hoping for big things from Specials. Uglies and Pretties both struck me as good dystopian adventure novels, but I felt as though they were building towards a spectacular conclusion, which would tie together all of the plot threads and character changes and leave me feeling satisfied and wowed. Unfortunately, that wasn’t my experience and, instead, I’m left feeling quite apathetic towards the entire series. I love the concept of Tally belonging to a different group in each of the books. The difficulty is that, in practice, its a technique that can alienate the reader. I had grown to enjoy her as a protagonist by the end of Pretties, but in Specials I found her even less likeable than in Uglies. 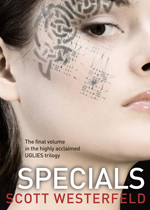 In Specials, Westerfeld asks his readers to identify and empathise with a character who is, essentially, a villain. This can work brilliantly when the villain in question is charismatic, mysterious or multi-faceted, but it is here where Tally falls short. She is little more than a puppet. In contrast, Shay is an interesting character. I remain unconvinced by her personality progression in the trilogy but, here at least, she proves herself the least-offensive of Westerfeld’s female characters. In a series where the protagonist merely reacts to situations (usually under the guidance of a male partner or friend), Shay initiates. However, Shay is the only supporting character who receives any real development in Specials. It may have been intentional on Westerfeld’s behalf, to show an emotional distance that differentiates the Specials, but it meant that an important character death felt rushed and emotionally dull and the conclusion felt unsupported. Another thing I found lacking in Specials was a counter to the destructive actions that were linked to mental acuity here and in the previous books. The Cutters cut themselves to clear their minds; the Crims deprived themselves of food. I felt that Westerfeld raised important issues, then failed to do anything valuable with them, so that I was left viewing them more as an attempt to be daring than a careful commentary on the challenges that real teens face. I found the ending of the series particularly dissatisfying. It didn’t ring true to me as a realistic outcome and it felt unsupported by both what Specials showed of Tally’s nature and the Uglies universe as a whole. Instead of being left wishing for more, I confirmed that I had no further interest in reading about this world and the characters within it. Specials is not a bad book, by any means, but I found it personally unsatisfying. As a stand-alone, I think it would make a good adventure yarn. As a conclusion to a trilogy, however, I found it extremely wanting. There are some great action sequences in here and some clever ideas about a dystopian future that has definite echoes of today’s existence. But I wanted more.